First off, a very warm welcome to the many new followers that have recently signed up to follow my adventures with watercolour. Just so you know what you’ve signed up for, I endeavor to put out a weekly post, normally on a Tuesday and, as the title hopefully suggests, it will usually be about the highs and lows of my efforts to master this most brilliant and frustrating of mediums. I can also be found on Instagram, Facebook, Twitter and Pinterest – but I do like to think of this blog and site as my home. So, please do make yourselves comfortable and have a good look around – it’s great to have you visit. So, thanks to WordPress, especially Michelle W for selecting my post, and to all of you for your likes and for following – it means so much to me and, over the coming days, I’m looking forward to visiting all of your blogs. Unfortunately, opportunities for painting have been few and far between this week. I do have a ‘work in progress’ but I didn’t want to show you this as I can’t tell yet whether this particular painting is progressing towards a frame or the bin – it really could go either way. However, with every cloud comes a silver lining. This week’s silver lining is that with no painting to talk about, I can properly introduce the latest addition to my ever expanding collection of watercolor palettes: The Frazer Price Palette Box. I came across this sketchers’ palette quite accidentally and had never heard of the make before. The fact that it was brass, boasted enameled mixing surfaces, and like nothing else I’d seen before certainly got my attention – especially because I know how highly regarded and renowned the brass palettes of Craig Young and House of Hoffman are. The box comes complete with it’s own water wells, one for washing brushes out, one for clean water and, the two mixing areas next to the water wells, are depressions on the side of a small water container. I have recently read the group’s comments on palette boxes and mention was made of the Frazer Price Palette Box – probably time that I enter the forum as I am Frazer Price. I designed and had the box manufactured, in Shropshire, and first came on sale in 1985 and continued to be marketed until the early ’90s. The box came into being because of my frustration with what was available for the travelling watercolourist. I was a publisher and whilst I was travelling extensively for Newsweek I would find time to sketch in one country before spending endless hours on my way to the next port of call and decided my time could be usefully spent by painting on the plane. I had a Gabbi box which was Ok but with only a curtain ring as a holding device it was uncomfortable. 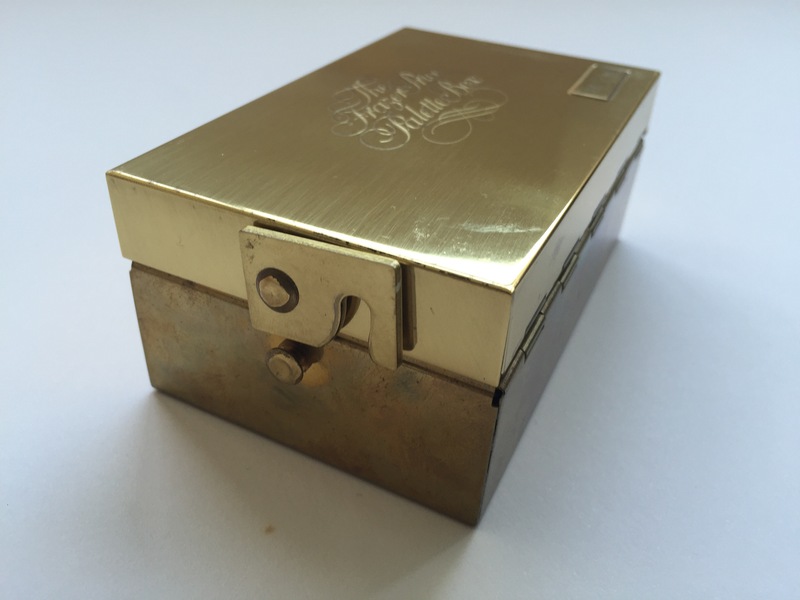 Therefore, over time, I designed a lacquered brass bijou type box just over 4″ long, under 3″ wide and 2″ deep. The inside pieces were made from washable plastic with room for 18 half pans or with slides for paint from tubes, a water bottle and a divided reservoir for clean and dirty water. Two fold out enamel mixing trays one with a thumb hole enabling the box to be held comfortably as as a palette. It was launched in the Leisure Painter in 1985 and the advertisements had an endorsement by Rowland Hilder-the only time the great man endorsed anything- the selling price was £28.95 and with a couple of price increases it was marketed until ’93/4 selling over 5000 boxes worldwide. It was also branded and marketed by Talens and Daniel Smith in the States. A point of interest when the box was first produced- the prototype costing £1,400.- I offered it to Windsor and Newton who initially showed great interest but then pulled out as they considered the box too ‘glamorous’ but asked if I would mind if they produced a plastic box based loosely on the FP box. I had no desire to go into mass production – hence the Cotman box arrived on the scene. If any of you have archive copies of Leisure Painter you might read an excellent critique by Ray Campbell Smith in the December ’85 issue. All that’s left now are a dozen boxes for the grandchildren and posterity. All my painting comes from the Frazer Price Palette Box and if you have the time click onto http://www.frazerprice.shutterfly.com and you’ll see it at work! The one I purchased was still in its original box, and with its original receipt – indicating that it had been purchased for £35 (reduced from £39! )- which would suggest mine was one of the more recent early 90s models, but still over 20 years old! Needless to say I’m chuffed to bits with this wonderful piece of craftsmanship and watercolor memorabilia. I was initially torn between using this, or just putting it out on display somewhere… but that really isn’t in my nature! So far I’ve filled it with paints and have done some little exercises in an A6 notebook, so not a proper road test, but it feels great to hold and the enameled mixing surfaces area a joy to mix on. I’ll hopefully be able to use it more thoroughly in the week’s ahead but in the meantime, I’m really excited about this new palette addition. Who knows… it might be the last one I need to make! Would love to hear from anyone else that has one of these, or if anyone’s seen anything similar, or just to find out what your favorite palette is? In the meantime, thanks again to all of you for following my efforts and I hope to return again next week with a painting or two to show you. I have recently bought the Winsor and Newton field box and would just love to own a Frazer Price. Hi Magny and thanks so much for this. The W&N field box is a great set, really wonderful for on the go sketching! The Frazer Price ones are great and I really enjoy painting with mine. They do still come up every now and then on eBay so it’s worth keeping an eye out. I’ve just been to visit your wonderful site which is really impressive and packed full of great advice and inspiration – many congratulations! Now that I’m following you I look forward to seeing much more. Many thanks Magny! Thank you John for the lovely feedback. I really appreciate that you visited my site. I love to help people be creative and to stay in touch with other creative people and I am now following you :-). I only discovered your blog today. Your paintings are WONDERFUL and I will be back to browse your site over the weekend. What watercolor brands do you use the most? I am enjoying my W&N field kit, but I must admit that I changed out the colour pans that came with it for my own favorite colours. Maybe I will review it for one of my blog posts soon. Thanks so much Magny, especially for the kind words about my paintings, I really appreciate it. You’re already preaching to the converted when you speak about the power, positivity and sheer pleasure that can be derived from creativity, in whatever form you pursue it – it’s wonderful and is now a core part of my life – albeit very focussed on watercolour painting in particular! Embarrassed to say…I have two. I originally saw one on a blog as a Daniel Smith travel palette. Apparently a few were commissioned and marketing in the U.S. by Daniel Smith. Even more rare than the Frazer-Price. When I eventually learned it was a Frazer-Price and based in the U.K. I started looking at the U.K eBay website. I found one but the lady changed her mind and pulled the auction. Then another that wouldn’t ship to the U.S. Finally I found two and bid on them both and won. Both. When it rains it pours. Not sure what I paid for each but it wasn’t 200 pounds. I think one I bought for a bit more than $100 U.S. Both were missing one of the slide in trays but since I use my own whole and half pans it doesn’t matter. both came in their original boxes and one has the original insert pamphlet. One does have a place for engraving initials. I’ve never had that done as I don’t want them to make a mistake and ruin my box. Now that I’ve read you can have a plate made and just attach it, I might do that. I am so proud of my boxes. Both are in great condition with very little wear if any. No scratches to speak of either. No major ones. I really like it better than the Winsor and Newton. I have one but have never used it. Now that I have the F-P I should just sell the W-N.
Hi there and thanks for this! If it makes you feel any better, I also have two – but in my case it wasn’t a mistake but more to do with a degree of obsessive-ness! After falling head over heels with my first one, I felt that I definitely needed a spare Frazer Price one just in case anything untoward should happen to my original one! By my reckoning, between us, we’ve got just under 1% of the original 5,000 made! LOL. I haven’t done the math but am tickled I have 0.5% of the original 5,000. I did consider selling the second but, like you, decided to hold on to it as a back-up incase one was lost, stolen or damaged or I needed some spare parts. Plastic gives me the willies as it ages and no matter how careful you are with it, it eventually cracks or breaks. There’s an engraving place near my parents’. I’m going there tomorrow so maybe I’ll take my box with me and see if they can engrave a small plate for it. The box is solid brass and seems pretty substantial. Unless they are really deep, shouldn’t be a problem to have the initals polished off and redone. They could even give the entire box a one over to polish off any superficial scratches and make it shine again. As far as I know, Tony Frazer, the designer is still alive. He designed this case https://www.jacksonsart.com/search/?q=frazer%20leather I have Tony on my linkedin page. I own that brush case. Stumbled across it at Jackson’s when I was doing searches for the Frazer-Price box. It’s nicely made but I’ve never taken it out for use. BTW I have what may be a Winsor and Newton prototype design bridge between the Frazer Price box that they were going to market but didn’t and the Field Box they eventually designed in plastic. Just won the auction on eBay and am waiting for it to arrive. I’ve got an e-mail inquiry to Winsor and Newton asking them if this is their prototype. Wow, that’s fabulous! My initial reaction is that this looks much older than an FP prototype. The types of latches and fastenings seem much more elaborate than anything that would have been produced even 20 years ago – looks like a real treasure of a find to me! Yes. I thought it was a real find. But I don’t think it’s that old. The tarnished brass and hand made quality gives that impression. But I do think it is a one-off prototype because it is using shelf available fittings (like that screw) rather than custom milled stuff. The rest could be hand manufactured like the custom boxes now. The cup with tab and slot design is reminiscent of some of the vintage field boxes that Winsor and Newton and Rowney put out in the 60s and before. (Probably made for them by FOME.) But those two flaps and the mixing area of the bottle scream Field Box to me. I have yet to hear from Winsor and Newton but I will be very surprised if this isn’t one of theirs. Perhaps a model before they finalized the design and went into production on the plastic one. It should get here within a week or two. Then I can have a closer look. I heard back from Winsor and Newton requesting pics, which I sent but haven’t heard anything since. I have more information. The box arrived today and I polished it up and found some very light engraving. One was a name: Gary Mansfield. On the side it says “Sample Box” and inside there is: Pat. Applied No. 197883/76. All hand done with an etching pen. I’ll be sending this additional info to W&N to see if that helps them track down any information on this. I’m going to take a photo of it next to the plastic field box for comparison but it is roughly the same size. The mixing wells seem to be a bit deeper than the field box which will make it nice to use if I can figure out how to load pans in it. The box itself is nicely made albeit more homemade. Nothing on the par with a Craig Young for instance. It seems to be a thinner brass. It’s what I would expect from a prototype. Sounds like you’ve unearthed something really unique and special. I wonder if there’s a way you can find out more by tracking it through the patents system – I would imagine they would have a pretty methodical archive!? Hate to break the bad news but your math is off by a decimal. 1% of 5,000 is 50 not 5. Still congrats for having this great treasure. Haha – yes! Of course you’re right Jeff and a perfect example too of why my accounts are always in such a state! From now on I’ll stick try and stick painting! Many thanks for pointing this out – it’s embarrassing, but appreciated! I finally saw a picture of the Daniel Smith version of this palette. If I owned the second one, it would be the Daniel Smith version. How many of those were produced? Hi Peg – I’m afraid I have no idea! I don’t know whether the 5,000k that were produced includes those that were sold under the Daniel Smith name, or whether the Daniel Smith ones were in addition to the Frazer Price originals. I’m in the UK and so far I’ve only seen the Frazer Prize versions come up for sale. Sorry that I can’t be of any more help with this. Damn, I’ve got decent brushes too! It’s all beginning to point towards talent, practice and persistence! Hi, I have one of these that I am about to put up for sale. It belonged to Douglas E West (father in law) artist. It still has it’s original box, slight damage to top as he had his initials on a separate plate on the top, we have removed his initials but has left a mark but new plate could be fitted over. Other than that it is in near perfect condition as he looked after all his art equipment with military precision. Was about to put it on eBay and wonder how much I should put as a reserve on it. Hi Mairead – I may have to look up your father in law – his name sounds familiar! Not sure I’m qualified to offer advice on reserve prices! There’s one on eBay that comes up today – started without any reserve and is already at £60 and likely to go up from that. The last one I saw went for around £186. When they’ve been listed really high, like starting at £200 – they’ve often hung around for a while as it’s a high start price in my opinion. I think the best thing you can do is provide a really good description and photographs so people can see it properly. The fact they’re selling for nearly £200 means there are collectors out there keeping an eye out for these palettes. I’m reluctant to suggest a reserve price but hope that this is of some help (plus there’s no guarantees – I think I paid around £60–£70 for mine) good luck with the sale though. If you do list it I daresay I’ll be keeping my eye on it! Hi John, thank you for coming back to me. Think we will put it on without reserve but will take me a couple of days as camera is playing up at the moment. It still has it’s Frazer Price sticker on the bottom but I can see he used it, tiny traces of paint in the corners. He mostly did watercolours with a very Victorian feel, lots of prints on eBay, the odd original turns up, we have some but most of his best ones were sold, as is the life of an artist. Most of his things did include the original receipts but I know he was given this as a present so no receipt. We moved last year so only now getting round to clearing some boxes and we were making up a job lot of watercolour pads, brushes and the box to put into a local auction where I doubt it would have make more than £10, so really appreciate your information and for taking the time to come back to me. My pleasure Mairead. Just seen that the one I mentioned previously that was at £60-ish eventually went for just over £130. I’d definitely mention it’s heritage and association to a well known artist too as this will give it added appeal/kudos and by all means pop a link in to this blog post too as that may help (or not!). As I say, I’ll be keeping a watchful eye out (tho unlikely to bid unless it’s looking like a complete steal – which isn’t exactly what you’re after!) Good luck tho – glad to be of some assistance. I to have one of these in the original box , it was my lafather in laws who was always painting with water colours. I will be putting it up for sale.was good to read your post as to find advice how much they sell for. Hi Sue – eBay’s great because so many people use it and because there’s no limit – it will go for as much as someone’s willing to pay for it. There are other sites , such as gumtree etc where you set your own price but I couldn’t really say which is best. I just know from personal experience that I’ve bought a lot on eBay. Good luck Sue, whatever you decide to do! I acquired one of these elegant boxes in great shape a few years ago and contacted Tony Frazier the maker of this prototype. He sent me a copy of the article from Leisure Painter. Very sweet of him. I contact Daniel Smith about more information on the box. However, current internet contacts there have no knowledge of the box. Hi Peg and thanks for this, do you happen to still have the Leisure Painter article – I’d love to see a copy of it if it was possible? It’s strange how little information there is about them considering what great items they are. I’ve been using mine a bit recently on some small studies and I’m really enjoying painting with it but would like to give it a stiffer test! Since buying this one I’ve seen a couple more of these crop up on ebay – one going for about £150 and the other still advertised at £195! Do you still use yours? Thanks for getting in touch. Hi, was sorting through my late uncles belongings a few weeks ago and happened to come across one of these boxes still in the orginal box and never used. Until now i have not managed to find out much about it online. What a find and I hope this info that I’d come across was of some use. Is it something you can see yourself using? Glad it was of some use Rachael. To the best of my knowledge, the palette was sold empty. It came supplied with three trays of four sections that could be filled with paints from tubes, or you could remove these three trays by sliding them out and replace them with pre-filled pans of colour. If you’re thinking of selling, particularly if it was on ebay or something similar, do feel free to contact my privately via my contact page as I have some tips that might help you realise its full potential! Wow – I would love one of those. I have used the W&N one for years now but I find the plastic mixing areas stain. I am guessing the Frazer Price one is no longer on sale commercially? Hi there and yes, I’ve had the same issue with my W&N box. My understanding is that the Frazer Price one’s went out of production in the early 90s. I found this one on ebay and got it for what I think was a bargain, considering its condition and how scarce they probably are now. I should warn you though, (before you think I’m crazily wealthy – or indeed crazy and wealthy!) there’s one currently listed on ebay for an eye watering £449! I think I just struck lucky on this occasion! haha, I know! Still, there’s a lot of difference between someone asking that and someone else actually paying it! Sorry Rebecca – that wasn’t my intention of course but must confess to feeling like I’ve completely lucked-out with this find! Thanks Rebecca, quite agree! I’ve also done a great deal of agonising about what colours to go with! All I need to do now is to use it! Looking forward to hearing more about your new palette, congratulations on all the recognition, what an honor! Thanks Margaret – am looking forward to getting comfortable with the new palette. We’re off on a short break at the end of the month which is when I’m planning on getting to know it better. As for the recognition- I must confess it’s given me quite a lift! Thanks Margaret – much appreciated! Thanks – much appreciated – shame it doesn’t guarantee me painting better but maybe I’ll just feel happier using it?